Inking Idaho: What a Wonderful Christmas! The company has cleared, my house is almost put back together and it's time to start stamping anything but Christmas!!! :) I've got thank you notes to do before I can stamp for Leadership and I'm so excited to get back to work! First though, a Christmas wrap-up. We were able to spend time with both sides of the family this Christmas and not do any traveling. You have no idea how wonderful that is until you've spend every Christmas driving across the Nevada desert from CA to Idaho. Now that we are here we are in Idaho and only 4 hours away from our families, that is one thing we are so grateful for! Santa brought Benjamin a lot more accessories for his MacBook computer. 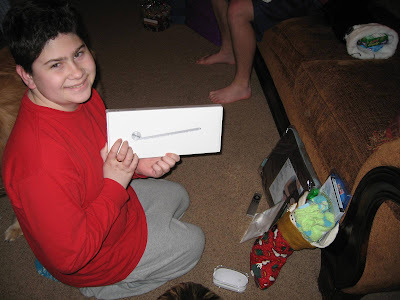 He got a magic mouse, adaptors, remote control, wireless keyboard and things I don't even know what they are. Wonder how Santa figured that all out?! 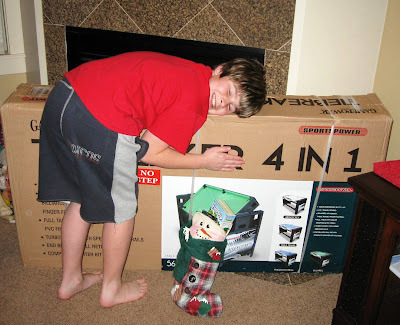 Santa finally brought Nicholas the pool table he's been wanting for years! Now he can play pool, air hockey, table tennis and finger football. Edited to Add: Oh my gosh! who knew these sock monkey hats would cause such a stir!! I bought them at a store called Fuego in the Boise Towne Square Mall in Boise, Idaho. 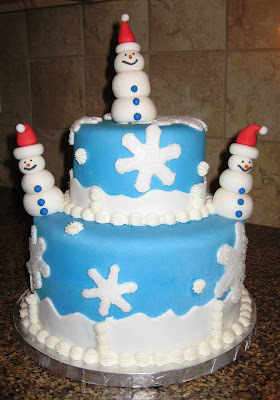 Benjamin made a fun snowman cake for dessert! Yum-o! 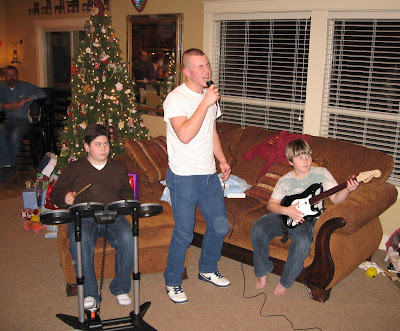 Christmas Eve we let the boys open their new Rock Band to play with all the cousins. My sister Kerry's son Cody was the most entertaining singer of the night! Hmmm...maybe he gets it from his mother?? My mom, the non-stamping appreciator :), and my nephew Cody (sporting his new Mohawk for wrestling), watching the Rock Band concert. Georges family came Christmas day and stayed a couple days after. 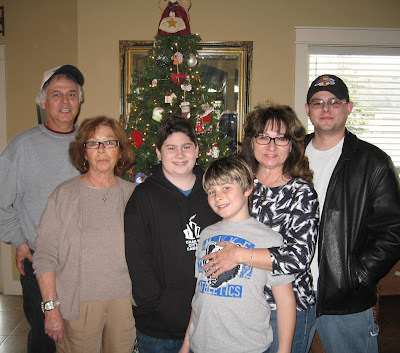 Benjamin and Nicholas here with Yaya (George's mom), his sister Helene and her husband Les and their son Lee James. We missed you Natalie & Kyle, hope you had a good Christmas visiting Kyles family! I hope you all had a wonderful Christmas with your families too! What a wonderful Christmas you had!!!! Thanks for posting pictures. WOW look at that cake!! Did he use fondant??? BEAUTIFUL! See you in a few days!! 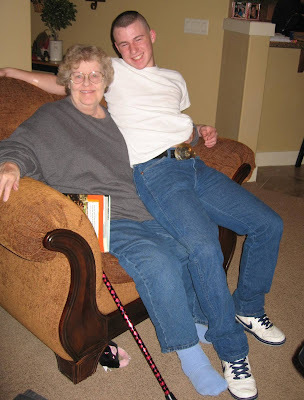 Becky...looks like you had a great Christmas visiting with family. That always tops the holidays being with family. Thanks for sharing with us. Your kids are so lucky to have such a talented MOM! Ha.. Nic looks like me on my Stampin Up Pic! SEE now he know how much I love Stampin up! :) hehehe... So glad you had an awesome Christmas ((HUGS)) to you all! omgosh. 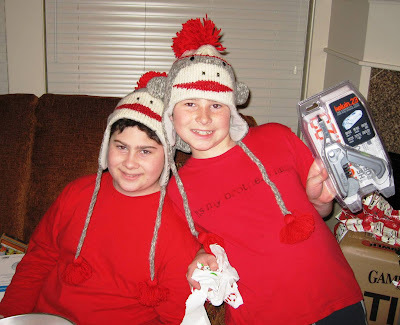 where did you get the sock monkey hats!?!? Looks like a fun Christmas! What a great looking cake - your son just gets better and better at his decorating. Hope the boys get to try out their hats on the slopes soon. Becky--looks like you and your family had a great time together. Benjamin - WOW!! Such a fun and beautifully done cake! I love snowmen. Nicholas - Congrats on your new pool table!!!! Becky - I'm so happy that your Christmas was wonderful. We had a wonderful one as well. Love the sock monkey hats. I'd wear it all the time too! Where did you get the Sock Monkey hats!! They are adorable! Please share! And how did you have the heart to cut into that awesome cake? Beautiful pix...thank you for opening your home, to our homes!! WOW, the cake is amazing!!! A big thumbs up to the next "ACE of Cakes" Benjamin!!!! I absolutely love the sock monkey hats!!! Where on earth did you find those!!!??? Happy New Year, and tell your Boys to keep Rockin'!!!! Those cakes your son is making are FANTASTIC! GREAT JOB!!!!!! He's inspired me to take some cake decorating classes...I hope Michael's in my area offers them! Benjamin did good job with the cake. He's better than me. LOL, yes, I knew how to decorate the cake but he's better than me. I'm glad you had great Christmas time with your family. My husband and I were thrilled to have our second grandchild on the way in 2010. Where in the world did you get the sock monkey hats? I have to get some for my family! And I have to say that your son makes the most amazing cakes. You must be so proud of him! Benjamin did another great job on the cake. WOW!! What a beautiful cake! If you lived closer I would commission Benjamin to make my cakes for the year!!! Oh my gosh! who knew these sock monkey hats would cause such a stir!! I bought them at a store called Fuego in the Boise Towne Square Mall in Boise, Idaho. Love the cake its so cute, my son got a drums and guitar game for the wii with some money he sold his old ds it was only $49 so he got a good buy. My Benjamin loves the cake your Benjamin made! He did a great job.....I think we may see him on Food Network someday! Thanks for sharing a glimpse into your celebration. 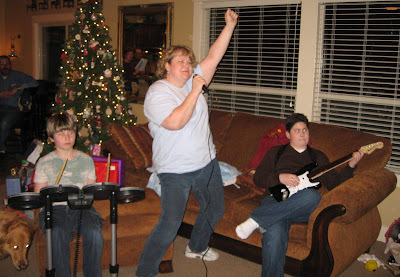 How fun....my kids got band hero too, we have had such a blast with it. Your son makes the most wonderful cakes, good job to him. Agh! I had to order sock monkey hats too! OK they were $30 each...ouch...I bet you were able to get them on sale in the mall! They are TOO cute!!!! I called the nimber on FUEGOS web site!!! Thanks for all your inspiration!!! Becky I got a good laugh out of those hats! They must be in high demand this year. My one sister in law bought one for her sister for Christmas. In fact it's on Facebook. My sister in law loves monkies! Looks like your Christmas was fantastic. Benjamin's cake was BEAUTIFUL! !